Severe drought in Gadag district has affected the wild herbivores, which are now coming towards the human habitats to quench their thirst. 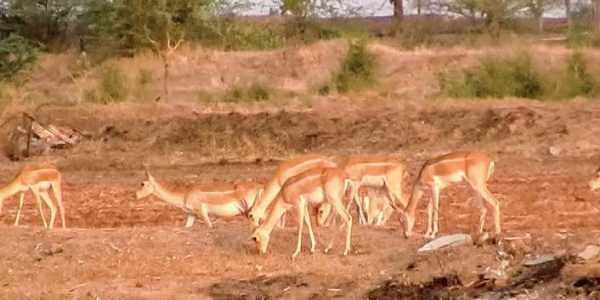 GADAG: Severe drought in Gadag district has affected the wild herbivores, which are now coming towards the human habitats to quench their thirst. Blackbucks and deer seem to have largely affected as they can be seen in agricultural fields and near the houses in Ron and Gadag taluks. Scorching sun, hot lands, dry lakes and leafless plants are creating a sense of fear among these animals. Hence, they are straying into the villages to quench their thirst. The villagers of Kotumachagi, Neeralagi, Abbigeri, Savadi, Hiremannur, D.S. Hadagali, Kurudagi and Yerebeleri are reporting close encounters with herds of black bucks and deers. There is no water in lakes and ponds in these villages. There are small ponds meant for the cattle and these herbivore try to drink water from them. Some of the deer groups venture close to the women, who wash cloths on the tank beds, and drink water. Thirst is making these animals leave their wild instinct and they are now found roaming in villages for water. “It is sad to see these animals wandering for food and water. The temperature is increasing gradually and more hard days are ahead for these herbivores. Our farms are dry now. On seeing many weak deer, some villagers are keeping water in buckets. The forest officials must ensure water to them by creating ponds,” says Somanna Sudi of Sudi village. A forest official from Gadag said during summer season, the wild herbivores walk longer distances in search of water and food. It’s common that sometimes they stray into nearby villages. The forest department has created small ponds inside the forest and also filled a few small lakes last month. The forest areas around Gadag have a number of deer and black bucks. If the villagers find any animal in distress, they can inform the forest officials at Binkadakatti zoo in Gadag,” the official added.